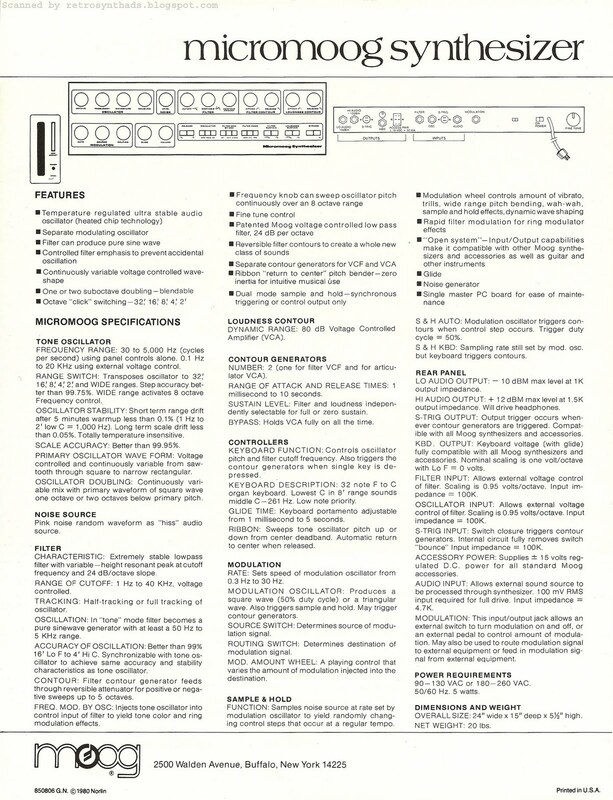 Moog Micromoog synthesizer reference sheet from 1980. Its been quite a while since I posted one of these Moog 1980 reference sheets I have kickin' around. I posted the Polymoog sheet and the Minimoog sheet in early 2010. I've even created a label called Moog 1980 reference sheet family since there are quite a few of them in the series. Like the two sheets that I have already posted, I've seen scans of the front of the sheet on many sites around the Web, but not the back. And, as I've always said, it is the back of these sheets that contain all the juicy info! And I'm not just saying that because I'm such a fan of wire-frame diagrams (of which I have to say I'm happy to see both the front and back panel of the instrument). For example, the back of the sheet also makes reference to the Micromoog's "open system" capabilities. Heck, Norlin even highlights this feature on the front of this sheet by underlining it. According to the sheet, the Micromoog open system consists of "extended input/output capacity, allowing you to "interface several Micromoogs so their controls interrelate". Huh? What? 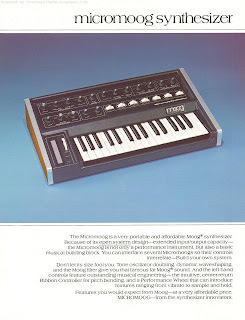 But in other aspects, this reference sheet tows the Micromoog party line first initiated in those earlier ads. "Human engineering" - one of Moog's favorite terms - is mentioned on the front of the sheet. As is the "temperature regulated ultra stable audio oscillators (heated chip technology)", that were initially positioned as "thermostated oscillators" in the synth's 1976 ad, and then dumped in the 1977 ad in favor of the more easily comprehensible "oscillator control circuit". And of course, the sheet hits on the fact that the Micromoog contains the same filter as the Minimoog to "give you that famous fat Moog sound". But it's not just the reference info on the back of this sheet that provides interesting... er... reference info... . Its also the date at the very bottom. 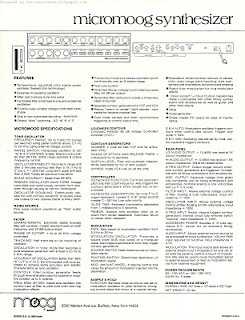 This reference sheet was apparently printed in 1980, but most Web sites, such as Wikipedia and synthmuseum.com have the Micromoog only manufactured until 1979. If Norlin was just clearing out the rest of the inventory, I doubt they would have included it in their 1980 reference sheet collection. They must either have had more than a few sitting around, or it was in fact still in production. 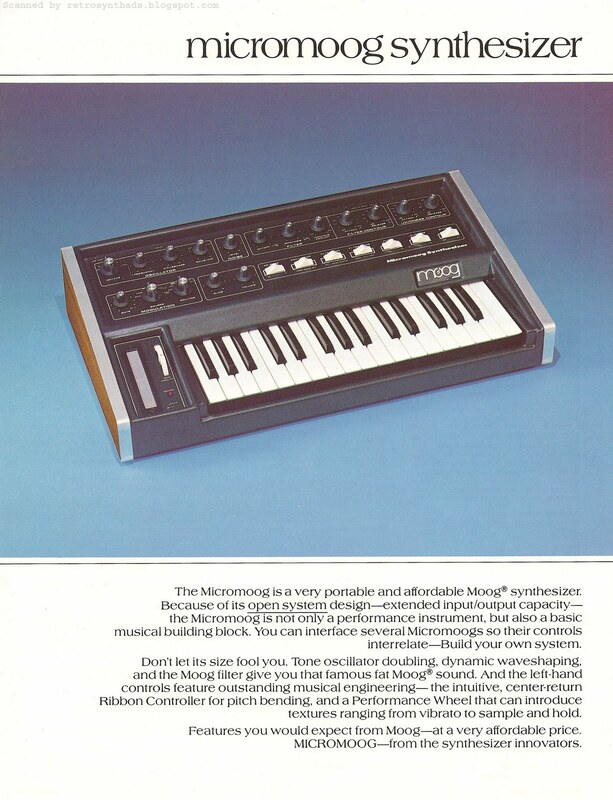 Also interesting is the fact that the Micromoog hadn't been advertised in Contemporary Keyboard since late 1977 - three years previous to this fact sheet coming out. There was a small Norlin ad that popped up in 1979 that included mention of the Micromoog, but nothing else Micromoog specific. I guess my point is that although it hadn't been promoted by Moog (in CK at least) since 1977, and manufacturing may have stopped in 1979, the company still felt that it needed to be included in Moog 1980 family of reference sheets. And that's family for ya!